THE MARTINI CHRONICLES: A Working Woman's Guide To Ensuring That She Makes It Out Of The Office In Time For Scandal! A Working Woman's Guide To Ensuring That She Makes It Out Of The Office In Time For Scandal! Greetings to my fellow hardworking Divas! And Happy Fall to you all! As many of you know, Fall weather not only brings colorful leaves and Pumpkin Spice lattes...it also brings brand spanking new T.V. shows. Last week, my biggest T.V. addiction returned for it's new season, and I'm pretty sure you all know which television show this Diva loves the most...SCANDAL! I'm super excited when Thursday rolls around because I know Shonda is going to have something special going on. As we all know, before sitting down to a heaping spoonful of Scandal, there are certain things that need to happen...driving home from work...cooking dinner...doing homework with the kids...putting them to bed early...you know the deal! And we absolutely cannot forget the all-important task of chilling the wine we intend to sip while sitting on the edge of our seat watching Shonda's masterpiece unfold. The key to getting all of these things done is getting out of the office on time. Ladies, there's no room for error here; we have to stay on task so that we can leave the office, get our housekeeping items done, and be sitting on the couch with our wine at 8:59 P.M. This may seem difficult for some of you with ridiculously demanding careers, but I'm here to help! I have prepared a 4-Step process to ensure that you make it out of the office in time for Scandal. If you follow these steps, I guarantee (kind of) that you will make it home in time to get your life in order, and make it to the couch...because isn't that the ultimate goal? Are you ready? Let's go! Step 1 - Get to Work Early - This step is super important! You have to get an early jump on the day just in case you encounter any Scandal impediments. What do I mean by a "Scandal impediment?" The impromptu meeting...the question from the client that you're sure you answered last week...the random conversation that you have with your co-worker regarding your amazing boots...the co-worker who insists on sitting in your office and crying for a half hour because she broke up with her boyfriend the night before...the team gathering in the lunch room to celebrate someone's birthday...any of these sound familiar? Now, I would prefer for you to avoid all Scandal impediments, but sometimes you can't. A simple solution is to get in the office early so that you have more time to get your work done before leaving. A side effect of this step is that you come across as a dedicated and hard-working employee/employer...not saying that you aren't on any other day of course! Step 2 - Make Sure There Are No Meetings Schedules After 4 P.M. - By a show of pearls, how many of you have been in an hour-long meeting that turned into an hour and a half? We cannot have this happen on Scandal Thursday! Hour and a half meetings disguised as hour-long meetings are Scandal impediments, and you are not here for it! Remember, the key is to be out of the office by 5. Obviously the 4 o'clock cut off can be scaled back or forward depending on your work hours, but the key is to not schedule any meetings in your last hour of work. A nice trick is to schedule a faux meeting on your calendar for that hour. Get your last bit of work done in that hour and scoot out of the office at quitting time! Step 3 - Bring Your Lunch From Home And Eat It At Your Desk - Simple step! You want to make sure you optimize all hours in your day, including the lunch hour. Pack a turkey sandwich or a salad for lunch and enjoy it at your desk while you do other work. The trick here is that you do not bring anything "clunky," so nothing that you have to warm up in the microwave. Sorry ladies, no Lean Cuisines on Scandal Thursday...we have a schedule to keep! And we do not want to compromise our mission by running into a well-meaning co-worker, and getting pulled into a conversation on how Scandal gives you life! To recap, turkey sandwiches, salads, Lunchables, cold chicken and/or pizza...all acceptable! Step 4 - Bob and Weave, And Avoid Eye Contact With Anyone As You Head Out The Door - Remember that well-meaning co-worker? She's hanging around the hallway waiting to strike up a conversation with the first person she sees.You really like her, but we do not discriminate when it comes to Scandal impediments...avoid them at all costs! Head in the opposite direction and make a bee line to the exit. Do not pass GO...do not collect $200...GET OUT! While you're scurrying out the door, do not make eye contact with anyone...he or she may be a Scandal impediment, and you can't take that chance. Keep your head down, and your shoulders raised. Hold your purse close to your chest and move at a pace of at least 3.5 miles per hour. You can breathe a sign of relief once you're out of the building! There you have it ladies...these steps will work if executed properly. Happy Scandal Thursday Divas! Enjoy the show and your wine. 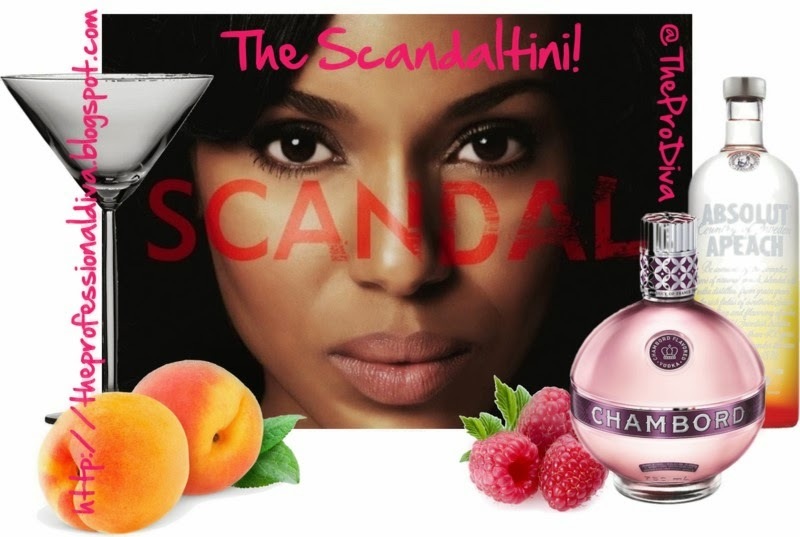 And for those of you who are fans of my martinis, check this one out: The Scandaltini! I think this my favorite post of yours yet! Lol! Thanks Sis! I'm sure you can relate! Lol fun post. These steps will surely work.